When I was a young girl, I used to play school with my stuffed animals and any friends that I could trick into being a student in my class. I made an Attendance List (the students didn’t always show up on time!) and I taught math, writing, art, and deep life lessons from a 4th grader. Sighing, I marked a big “L” beside his name. It wasn’t always roses and puppy dogs. While I didn’t end up becoming a teacher, I do like to pretend I’m one on the blog. I also know when you’re skipping class! I’m on a fruit butter making kick. Earlier this week, I made my beloved pumpkin butter in a slow cooker and turned out wonderfully. I’ve been spreading it on everything and mixing it into oatmeal. As soon as I see sugar pumpkins at the market, I will be making pumpkin butter from fresh pumpkins later this Fall. I added fresh ginger, ground cloves, cinnamon sticks, 1/3 cup Sucanat, and a 1/4 cup of apple juice instead. Then I bought 5 pounds of local, sweet apples! It took me just 10 minutes to peel 5 pounds of apples. Not too shabby! I diced the apples. I added cinnamon sticks, fresh ginger, apple juice, ground cloves, and a touch of Sucanat. I heated on high covered for 1 hour. I waited. Then I turned the heat to low, still covered, and cooked for another 15 and 1/2 hours. I waited. I may have slept. I’ve been cooking it on medium heat, uncovered, for a couple hours so far this morning. And I’m praying for a miracle. Anyone have any words of advice for me? Did I make it all wrong? I have never made apple butter, but want to someday. Apple butter was always a favorite of mine growing up! 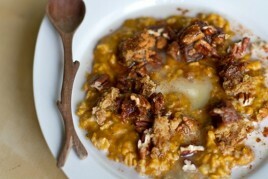 PS: I made your Apple Pie oats this morning and LOVED them! It was the perfect breakfast for a very chilly MInnesota morning!! It looks delicious! Its been cooking for a while, I wonder if taking t for a spin in the Vita Mix would get it to the consistency you want? Do you think that you need to add more apples? Personally, I think it looks delicious! I love making apple butter! I always use a stick blender at the the end to smooth it out and give it the right consistency. Also, I don’t really use a recipe, but just add apple cider, cinnamon, and ground cloves and it turns out great! Good luck! Last year I made the apple butter recipe from my beloved crockpot book Fresh From the Vegetarian Slow Cooker. If I remember right, I cooked the apples on low for several hours and then took the lid off and cooked it a couple more hours on high. My apartment smelled AMAZING. If memory serves, the total cooking time was around 8 hours. apple butter takes a long long time to get to a lovely thick buttery consistency. just keep cooking it! i usually start with making apple sauce and then put the spices in with the sauce in the slow cooker and it still takes many many many hours, so don’t give up yet. I found a recipe for apple butter on The Kitchn and they said just to cook applesauce on low on the stove top until it turns into apple butter….So it sounds like you’re on the right track. Here’s the link if it helps. It still looks delicious though! I would happily eat it up in it’s current form. I’ve never made apple butter before so I don’t know what to tell you – hopefully all it needs is more time?! Angela, I make apple butter every fall. It makes for great Christmas gifts, and everyone always loves it. This is how I do it. I core the apples and cut them in half (no peeling required). I bake them on a cookie sheet with a some water until they are soft. Then, the peels just come right off, and I scoop out the soft flesh. I blend most of it in the food processor, reserving some of the cooked apple mush to stir into it after the rest is pureed to give it some texture. Then I add the sugar and spices and cook it in the crock pot with the lid tilted for 8-10 hours. I sometimes have to add in a bit of apple juice throughout the cooking if it cooks down too much. The consistency is perfect, and the flavors get very concentrated. But what do you do if it doesn’t thicken to the right consistancy…mine is somewhere between applesauce and apple butter…just keep cooking it? I hope it comes out well! I wouldn’t have used the 4 cups of sugar either, that’s a bit much no? I think it’s on it’s way to deliciousness. Even if it doesn’t completely break down, chunky apple butter is probably great. 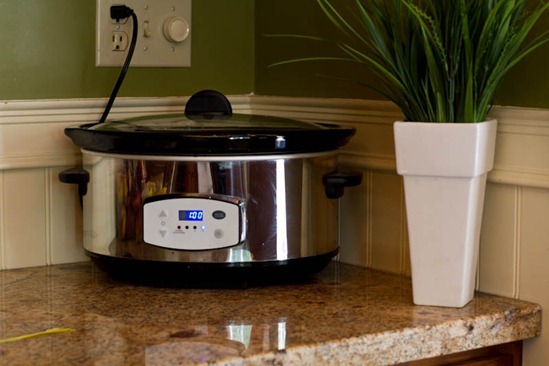 This post reminds me that I’ve really been neglecting my slow cooker. No clue — but I would have a hard time waiting that long for it to work! It looks incredible and I would love to lift up the lid and get a big whiff. Yum! Oh my goodness. Such memories. The first apple butter making experience involved me as an 8-year-old helping my Mom and a friend. I managed to badly slice my hand with an apple peeler. . . The second apple butter experience was just with my Mom. We got everything going. I think we were trying an oven-baked version, as opposed to stove top. We went off into the living room for stories, and then my brother and I went to bed. The next morning, I found out my Mom and fallen asleep, or gotten into listening to the radio or something. . . and the apple butter was burned! However, my Mom managed to salvage some of it (though you still kind of had a burnt apple taste on your toast from the spread). Anyway, on both occassions, though, everyone was surprised how long it took for the water to evaporate (as is what lead my Mom to forget about it in the oven, I think). So, have no fear, you are on the right track. Just be sure to monitor it every hour. (wouldn’t want a burnt apple butter story to appear on your blog in a couple weeks. . .). I’ve never made apple butter before…But it looks amazing still! If anything, it will be like really delicious applesauce! 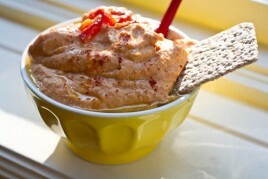 ;) You could probably puree it in the vitamix too! I think it looks delicious! If you want it thicker, maybe you could give it a whirl in the blender, then put it back in the CrockPot to keep cooking off the water? I am looking forward to hearing how it turns out. I have always wanted to make apple butter. I want to give out little jars of apple butter as favors for our wedding so I’m very interested to see if this works! I hope it does!! Wow! What an awesome way to make homemade apple butter! 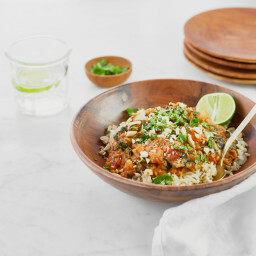 :) I never would have thought of using a slowcooker! I would use an immersion blender in it. It looks tasty!! Anyone ever freeze this or pumpkin butter? Thinking about making a big batch and freezing so I can enjoy all fall. I freeze apple butter all the time. Instead of putting it in jars, just put it in freezer containers and put in the freezer. Question for you regarding the pumpkin butter, did you use the exact same recipe as your stove top method or did you make any modifications? 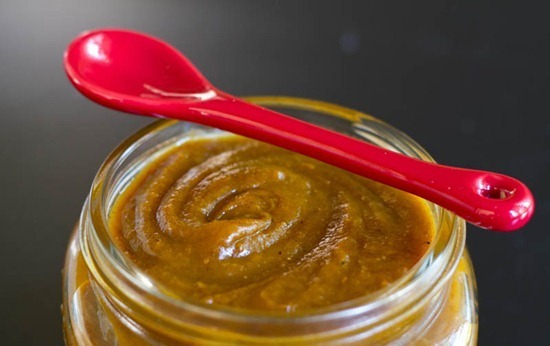 I want to make the pumpkin butter this weekend and I love the idea of making it in the slow cooker. Yup, I used the same recipe and just cooked in on high for 45 mins or so and then on low until the thick, dark consistency was achieved. That’s it – you and Mama Pea have both convinced me this morning that I need a slow cooker!! Regardless of whether it’s apple sauce or apple butter, I’m sure it will be delicious! I’ve never tried making apple butter before… Does it need to be blended after? If it’s a super cinnamony apple sauce mixture then I think it’ll still be a hit! Two thoughts. First, echoing previous commenters, apple butter in my experience takes a LONG time to cook down (and I’ve generally done it on the stovetop). With a lid on the slow cooker, I imagine evaporation of the water would be slowed. Second, I’ve made a bunch of batches of apple butter, and I’ve found that the color varies considerably, so don’t stress about that. My latest batch has the right texture and taste, but is surprisingly light in color. When my mom used to make it she only used the juice of the apples and cooked that down nice and slowly into a thick and delicious paste. Good luck! 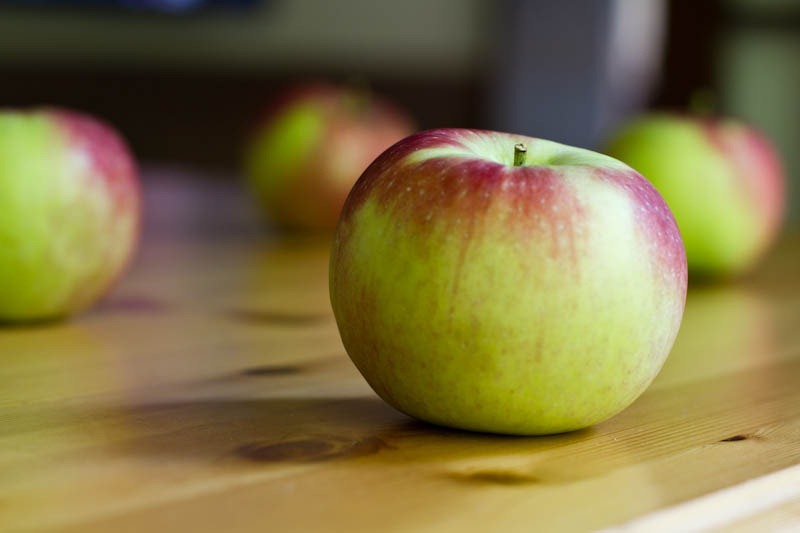 Great post Angela – I was actually thinking of making some apple butter this weekend! It sounds like you are on the right track, but I agree that leaving the lid on the slow cooker probably made evaporation minimal, especially if yours has a good seal on it. We have a tree at home that is overflowing with golden delicious apples…maybe not the ideal variety for apple butter but worth a try! I asked a friend, and she suggested stewing them – cut around bugs or just cook them then core and with skins on. Use a European tomatoe press to take out the yuckies. Now I have to go shop for a tomatoe press! You didn’t do it wrong! It has to cook for a LONG time. Seriously I cooked mine for over 24 hours. It keeps getting darker and better the longer you leave it, I promise! Keep chugging along!!! I live inside my Google Reader too much, LOVE the header! As for applebutter, the one other time I have made it, I started by making homemade applesauce (quartered apples with a cup of water or cider and cook till mushy, then push through a Foley Food Mill) and added my seasoning and cooked that down. Your’s is looking fantastic. Just keep an eye on it, and if you want it smoother, blend it up! Apple butter is delicious, my granmother always makes it, we have a beatiful orchard and she picke each apple with care!! :) Also, I had some very good apple butter in Pigeon Forge, Tennessee! I am thinking that maybe once it cools down it will be thicker – that the heat makes it thin. I know this is out of the blue, but I just wanted to say a huge thank you to you…it’s been way too long since I’ve commented (I’m still reading, though!!). You were such a great encourager when I first started my blog, and I can’t believe I’ve been doing it now for about two years! I feel like it’s already come so far, and there is still a ton for me to learn! I just made several batches a few months ago. I think some apples have more water content and take longer especially if they are just picked. We have several trees so we always have a lot of apples. 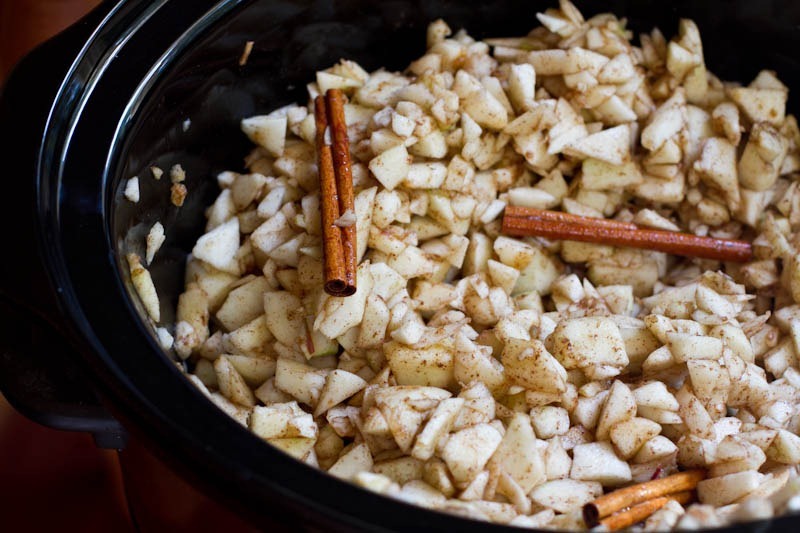 The recipe I used for crock pot apple butter says to put the apples in the blender near the the end of the cooking process and lightly pulse to the consistency you want. Then return the apples to the crock pot and cook UNCOVERED for the last hour checking and stirring as needed. It worked perfectly. I also made big batches of applesauce, and my favorite was apple pie jam. That looks awesome as is, but continuing to cook it with the lid off might cook off the rest of the excess moisture. It looks yummers to me! Just keep cooking it! Usually when I make apple butter in the crockpot, I cook it over night (8-16 hours) with the lid propped open the whole time to let some of the liquid evaporate. Then blend with a stick blender at the end to reach the desired consistency. Good luck! Hmmm…I actually think it looks great!! You know what’s funny… yesterday afternoon the weather was getting a bit nippy and I thought to myself, I want to make apple butter! SO RANDOM. It looks to me like you’ve got a chunky apple butter. Maybe puree it ? You have given me so much to learn, and so I wish I could give back. But I have absolutely no idea! Although, I totally pretended to be a teacher too. I was even going to school for it, when I realized it is so much more fun to be an aide or volunteer in the class than the actual teacher. Hmm wish I could help! But (and you might already know this) if you’ve lowered the sugar content of the original recipe, it might not be shelf stable. Not sure how you were planning on storing it but in the freezer might be best. Props for the rapid apple peeling. I have one of those apple pealer core remover things that you twist the apple on, best invention EVER. We have a place in the foothill called Apple hill. We make a yearly day trip up to pick apples, sample apple wine, try all the other apple amazements. It is great fun! I can’t wait for fall to kick in. I have made multiple batches like this over the years, and it always turns out. And I’ve never needed to add sugar or sweetener of any kind – though that may depend on the type of apple being used. Oh I forgot to mention ….YUM!!! Can’t wait to try the recipes. I love pumpkin butter and anything with apples :) Thanks for your amazing recipes. At least what you have looks amazing!! Can’t wait to find out the trick to finishing it! Homemade apple butter sounds amazing…the fact that I can make it in a slow cooker is just icing on the cake! Zero advice from me – I’ve never made apple butter and don’t even have a slow cooker! But good luck! that pumpkin butter looks amazing! Hey Angela!! Just wondering about the Glo Bakery, are you still doing that? When will it be re-stocked!? I am anxiously waiting! I’m sorry that I don’t have any in stock- I had a sale Wed. and everything sold out super quickly (I think 5 mins or so!). I wish I could make an unlimited supply. I will be sure to update the shopping cart when I know when the next release date will be. Can I get a hall pass, please? I really need to pee. hmmm chunky apple butter isn’t so bad. Maybe try using an immersion blender? Or letting some moisture escape to condense it even more might work. I’m just guessing here but I wonder if the 5 cups of sugar helped break down the apples in the original recipe….could you process it in the food proccessor beforehand or after? or just the apples beforehand or after? I agree with the comments on leaving the lid off. I haven’t made this in a long time, but you do have to reduce it down by letting the moisture evaporate. Also, my father used to make apple butter without sugar. He would add raisins to the apples. It made the thickest, richest, most naturally sweet apple butter. I can help you! First, I boil the apples over high heat to give them a head start breaking down. Make sure the apples are covered well with water to start. Boil for about 30 minutes. Then I throw it all in the vitamix once it’s cooled down. After blending, THEN put it in the slow cooker on low, with the lid barely cracked and cook for at least 12 hours! Perfection! Ps- don’t add anything to apples until after you purée. Good luck, you’re going to love it! I need to make that pumpkin butter. To get the consistency of apple butter – you have to keep the lid on, but prop it up with some knives. I wish I could draw you a diagram. 1) lift up the lid on one side and slide a knife into the crockpot and let the lid rest of the knife. 2) Use a total of 4 knives. 5) on low for 4-5 hours and it should be nice and thick! Also, you don’t need to peel the apples. If you make the apple sauce first and then just puree it, the skin gets broken down anyways and you can’t tell with the butter. PLUS the skin is where all the good stuff is. Good luck! It ended up turning out after 4 more hours of cooking with the lid ajar :) I was shocked!! Made just over 1 cup of butter and it’s soooo rich!! I hope it turns out! I love apple butter and was turned off from making it because of the sugar. I put a dish cloth under tin lid to absorb low moisture. I use a hand blender to puree the apples whew they are transferred to the stove top. I use agave instead of succanant. I had a quick question re: Sucanat. Does it have the same effect on your blood sugar as white sugar, or is it slower absorbing like molasses and brown rice syrup and other natural sweeteners? I can’t eat the former but natural sweeteners don’t seem to affect me as much so I’m curious about Sucanat :). I’m not sure about its effects on blood sugar, but I do know that Sucanat is whole cane sugar which means it is pure dried sugar cane juice and the least refined. I loooove it. It’s not perfect for every recipe (tends to be dry), but it’s very wholesome tasting. brown rice syrup is a sweetener that’s not supposed to spike blood sugar levels, but give a slow release. I don’t know if that’s been confirmed or not? When I made apple butter I blended all my apples into applesauce before I baked them down in oven (the house smells divine! )…but I really like the slow cooker idea because mine had a tendency to burn near the end :/ I would suggest blending yours’ up either with an immersion blender or a regular ol’ blender, to get it nice and creamy and spreadable :) then cook it some more with the lid off to get rid of any excess liquid…if you can wait! We made ours in the oven, but always make applesauce first and then turn it into apple butter with all the spices. It takes about 2 hours in the oven, and a lot of moisture evaporates. That would be a quicker method if you’re not set on using the slow cooker. oooooo fruit butters!! I think I wanna make some too now! Hmmm Never tried making it before Angela, but I think fruit butters actually have MORE sugar in them than jams/preserves do? So perhaps it wasn’t enough sugar? I have never made apple butter before but I LOVE it! 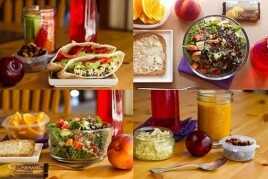 I would definately like to make some soon! I can see [from your reply to Leanne] that you got it done! Hopefully we’ll see some photos :) & I played school ALL the time when I was little :) Along with dentist & store! 4 hours is fast! Good for you. Mine took so many hours I forgot to count. It was a multi-day project. But a very large batch, too, from almost a half bushel of seconds apples. I core the apples (’cause of the cyanide in the seeds) but I don’t peel or chop as finely as you did. If you have a food mill, it’s awesome for smoothing out a puree while removing the peels. If I had a strong blender like a Vitamix, though, I might keep the peels. I’ve never made apple butter, but what you described is exactly how I make homemade applesauce (minus the sugar)! Also, it’s not necessary to chop the apples as you did. Within 3 hours in the slow cooker on low, they turn to complete mush. I just use an apple slicer and throw them in that way. I’d be interested to know if I keep cooking my applesauce, would it turn into apple butter?? I think so. I started by making applesauce and cooked it down further (a LOT) into butter. Another previous poster started with sauce, too. I think I reduced it 300% or more. I also added spices, but I don’t suppose that’s required. All I know is your house must SMELL AMAZING!!! 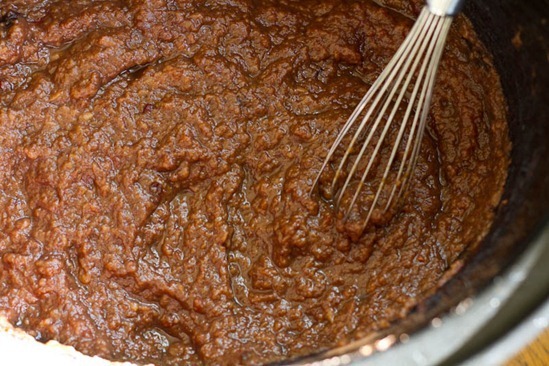 Do you need a slow cooker to make apple butter? 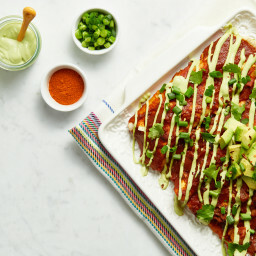 I would LOVE to make some but don’t have a slow cooker and wasn’t planning on getting one anytime soon. I know someone who used an oven, but I don’t know the specifics. My mom always used a stovetop or ove method. It takes more monitoring than a slow-cooker, but the results are still great. I think the apple butter will be delish. I know you guys don’t have TJ’s up there but I am thinking of the TJs apple and pumpkin and mango butters…they say they are just fruit, sugar, pectin on the label but I don’t know how they get them so smooth. I would love their secrets :) No matter how much I blend them in my Vita, it never gets that perfect texture like theirs does. Your recipes so far sounds amazing! I don’t know if this will work but you could always try adding in some arrowroot if you have any, it’s made to thicken things up and always works for me… I don’t think it has any real taste to it so it wouldn’t affect the butter! I love following your blog and have been consistently checking in, nearly every day, for a year now. I am making some nut butters for Christmas gifts this year and was wondering where you find those cute little spoons you always photograph (see photo in this blog)?? Thanks Lauren…that makes sense to me! I’ve found that if I prop the slow cooker lid up on a wooden spoon laid across the top of the pot that lets off the steam as it cooks and the cooking time is a little shorter. I’ve never been brave enough to attempt making fruit butter before so I have no words of advice for you. I hope it turns out though because it sounds delicious! That looks so incredible!! I loooooove apple butter! the apple butter looks so yummy! I bet it turned out good! I’ve had the most success roasting whole, cored apples covered in foil at 200 degrees for a few hours. No need to peel or anything. They literally liquefy. Then puree (in my old and clunky food processor) and press through a strainer (to get out the core/seeds nubs that might remain). To make the butter a bit richer I add a knot of Earth Balance, some maple syrup and spices in the empty core before baking. It always turns out smooth and sweet and buttery. I made peach butter recently (though I used canned because they were about to expire) and cooked it on high for a good six hours and then uncovered for another 4-5. Cooking it on low probably extends the cooking time by quite a few hours. Good luck! It look delish already! mmm I would love to make peach butter! I’ve made apple butter without sugar many many itmes and it came out just as creamy as the stuff from the store after blending it with my immersion blender only. If that isn’t creamy enough, you can always stick it in the Vitamix! I can’t wait to see how this turns out. I am also interested in the pumpkin butter. sounds yummy. I’ll have to check back and see if any of the responses helped. I, unfortunately have no experience. I’d eat it! Looks super! But try putting it in a food processor? I saw a recipe that starts out using applesauce. 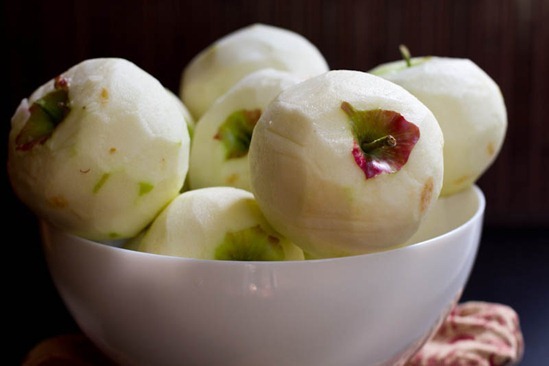 Other recipes using cut up apples seem to come and coarse and thicker. Still delish though! I make lots of apple butter every fall. It’s quite easy to make sugar-free too. Just core, cut (and peel, if you want… not required but I like to save the peels to make apple peel jelly), cover in sugar-free apple cider, add any desired spices. Cook on low in slow-cooker until soft enough to mash (either with a fork, a potato masher or an immersion blender, depending on your apples and preference). Then, prop lid open for a few more hours until it is thick and brown. Even though sugar-free, it can be canned. If you can find Wellesley Apple Cider, they have one that’s sugar-free. I love it! 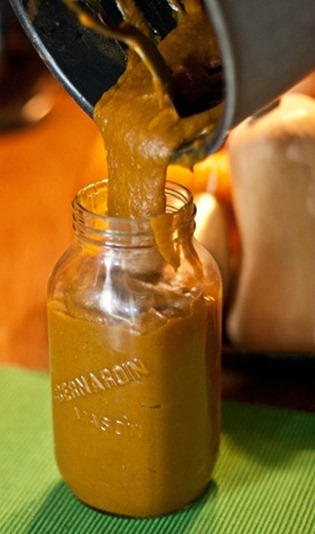 Although Pumpkin Butter is also delicious, it can’t be canned since it is a vegetable. Enjoy! Maybe blend it? I’ve never made it before so not sure but perhaps a stick blender might help or even adding some sugar syrup? Oh no I hope you figure it out!! Apple Butter is soo good! I’m kind of craving it now! I made apple butter this past week in the crock pot! I’ll post the recipe sometime next week. I actually did a rough chop on my apples, used very little apple juice, some spices, and no added sugar. I didn’t peel them, and I put them in the slow cooker practically whole. I had my slow cooker going for a good 18 hours before sending the contents through the blender. I used to make stovetop apple butter, though without the sugar. (Apples are sweet enough when you cook them down!) I found it worked best if I didn’t add any extra liquid and cooked it super slowly, though if I wanted to do things a little faster, I’d squeeze excess moisture out of the apple pieces when they were just-cooked. And I always cooked uncovered, so that the excess moisture could evaporate. Good luck! She cooked the apples sliced with skin on for 15 hours on low with apple juice, apple cider vinegar, spices, and water. Then she let it cool for a bit and blended it in a blender. Hey if you want it smoother maybe just put it in a blender! 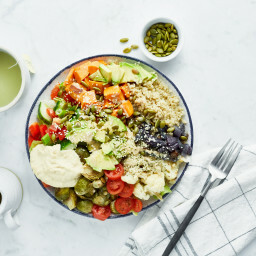 It looks yummie to me! I can’t offer any advice on the apple butter since I don’t have a slow cooker, but can I just say that i am SO happy to hear someone else played school as a kid??? We had rows of school desks set up in our basement, in fact! I of course, was always the bossy teacher. Obviously you can relate :-) I never became a teacher either, but I did remain bossy. OMG! My daughter’s name is Annabel, spelled just the way you wrote it……I’ve only ever seen it one other place (a children’s cookbook writer named Annabel Karmel). It made my whole day to read the blog today! how long will these last in the fridge? the pumpkin butter looks just as yummy! When I made slow cooker apple butter, I first cooked the apples to soften and then ran through a food mill and made applesauce. (I left the seeds & skins on, the food mill will whisk them away!! So much easier than peeling.) I then added sugar & spices to the applesauce in the crock pot and cooked all day. The pre-smoothed product made for more surface area and faster cooking, I think. Kind of like the pumpkin has already been cooked once from its raw state & blended. Yours looks to be the right color, though! I made this yesterday using your sugar subs and Allrecipes spice combo- and it took forever but it is fantastic! Thanks for the inspiration – I didn’t even know you could make apple butter in the slow cooker! I’ll definitely be making it again.. I am making apple butter right now with apples from our family tree! I am using a fusion between of a recipes off pinterest for slow cooker apple butter and yours! I reduced the sugar b/c I don’t like very sweet. Any tips? I hope it goes well. Awesome Idea…I am new to your site but can’t wait to check it all out. Great Work! Haha, I used to play school in the exact same way!! I would also FORCE my little sister and best friend to be students often. I made sugar free apple butter this year for the first time, after getting some advice from professional apple butter makers. I added arrowroot into the cider/juice before adding it to the apples and cooked it for 24 hours. 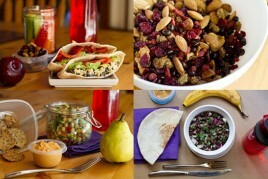 You can check it out at seasonalfamily.com if you’d like! But I’m sure even thick and lumpy like the above picture would taste delicious! How can you go wrong with spices, apples and a little bit of natural sugar. Two reasons I can see that yours took so long to thicken. Second, you used liquid versions of your sugar substitutes. Remember that apples are mostly water already, so as you cook them… even without adding a drop of liquid… you will have an inch or two of pure liquid at the bottom that has to cook out. By adding more… it has to cook longer. There is no harm in it cooking longer if it is in a crock pot as it should never get hot enough to scorch. It would be difficult to make your recipe over the stove as it gets hotter and will likely scorch before the water ever cooks out. I’m sure it tastes amazing even if it did take an entire day. I also use the tip that another comment mentioned… prop the lid up after the first 6 or 7 hours by placing wooden spoons across the pot and setting the lid on the spoons. This leaves some room for the steam to escape and get some of the moisture out. I live in Australia, I have never, ever heard of Apple Butter?! What is it?? It sounds amazing. I assume the apple butter is ready by now :-) For what it’s worth: the sugar you left out (so would I!) does the trick so maybe you would need to use a thickener like psyllium? Your apple butter is looking lovely! I always start with making apple sauce on the stove top. I place apples (peeled and cored) in a large heavy sauce pan along with about an inch of water. I cook it on high until it really boils and then back down to medium with the lid on, stirring occasionally until they are cooked through. I then blend and transfer to a crockpot, I add spices desired, some orange zest, orange juice and sweetener. I cook for 12 to 16 hours on medium with the lid tilted or resting on some butter knives. I actually made apple butter for the first time yesterday. Pretty much the same recipie you used except I went with the sugar ;) after you show cook it for 12 hrs you need to use a blender or hand held blender to smooth it out. I am new to making apple butter, but from my short experience I’ve learned these things…it does take several hours in a slow cooker and I have 2. When I cook a batch in each at the same time, I will have an apple sauce consistency in one and huge chunks in the other all because one gets much hotter on low setting than the other. Of course the slower unit will eventually cook them down. But some units just get hotter faster even if both are set on low. Also some apples cook up better than others. Cortland apples cook up perfect. This year, I couldn’t get any, so I’m cooking Cameo apples. They are a little chunkier, but I like the texture. Cooking with lid ajar, or off at the end, will help it thicken up. Now. I’m going to try pumpkin butter. Thanks! I was very unhappy! I made a double batch of runny sweet tasting goop that would run right off the edge of my toast.Not good. I looked at bunches of recipes online and after about 4 hours of mind bending internet reading I found the cure (at least it’s worked for me now 2 years in a row) ! I had been coring my apples before cutting into pcs. I found out the core area around the seed actually contains a natural chemical that works like pectin! I made the next batch the same way as the first but left the cores in. After I cooked apples down into a mushy consistency I removed the apple mush and ran through a sieve attachment on my food processor to remove any seeds or course pieces from core. Then I put back in crock pot and cooked on low for another eight hrs without lid . It came out thick dark and delicious. No more running off my toast or peanut butter sandwiches ! It was a little more work, but well worth it. OOPS,forgot to mention. After simmering for eight hrs put a couple TBSPs in a bowl and let chill in fridge until cool then test consistency. This will show you what your gonna end up with and let you know if you need to simmer longer. It will always be runnier when hot.